Coventry Bears try to stop the Oldham attack. 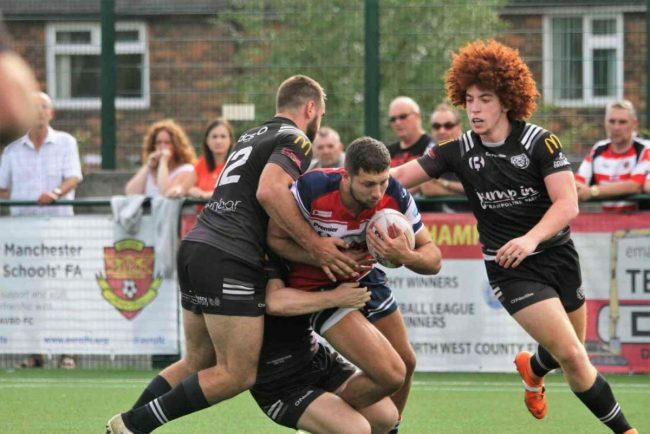 HEAD coach Tom Tsang believed Oldham’s ‘relentless nature’ was what did the damage in Coventry Bears’ 58-6 defeat to the League One promotion hopefuls. It proved to be a difficult afternoon for visiting Bears with Dane Morley-Samules getting their only try of the game, with Ben Stead kicking the conversion. “Oldham is a notoriously difficult place to go and get a win,” said Tsang. “They are a very direct and aggressive team who play through the middle channel of the field and if you don’t match them in the forwards they have the ability to steamroll any side. “In patches we managed to contain them and at times we were the better side but their relentless nature was what did the damage. Up next for Bears is a home clash against North Wales Crusaders on Sunday. “We will need to be much more consistent against an in-form Crusaders,” added Tsang.